I just came upon your archive through visiting Bay Windows. I wanted to let you know how much I enjoy your poli-toon. I am a big fan of intelligent irony and sarcasm. So here I am, waltzing through the archives when all of a sudden I get to "Shallow Grave" and begin crying. How respectful and poignant. Thank you for using this medium and your talent to shed insight on this horrible incident and the attitudes that surround this type of "margin" crime. All I can say when I get an email like that is ... wow. I guess I'm in the right profession. 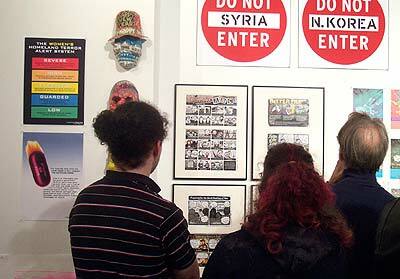 Anyway, the above photo is of folks reading my cartoons at the Art During Wartime art show opening Saturday night. If you're in the NYC area and you haven't been, it's open all week (see previous post for info/hours) and there's some really amazing work (those Do Not Enter signs above my cartoons are one example).